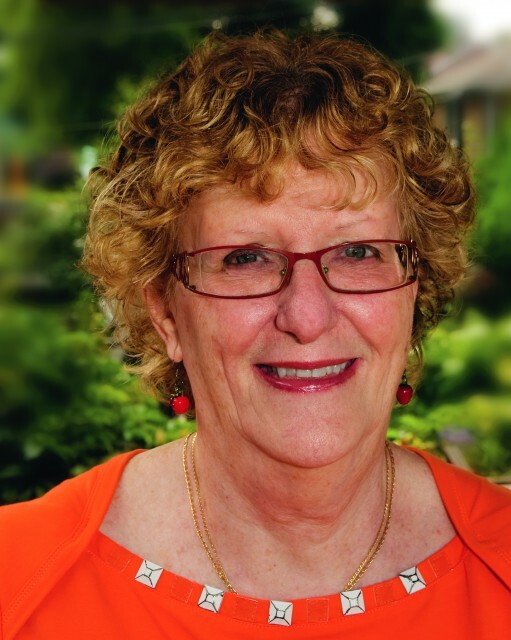 A couple of weeks ago, I had the pleasure of interviewing cookbook author Norene Gilletz. Norene lives in Toronto, Canada. 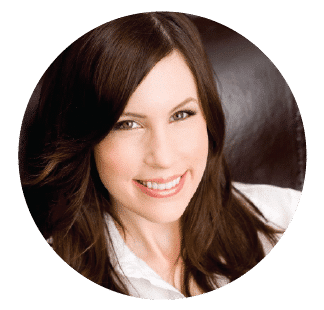 She’s the author of some well known cookbooks, including The New Food Processor Bible, Norene’s Healthy Kitchen, Healthy Helpings, and several other dietary cookbooks. Norene is known for her healthy Jewish and kosher cooking; her site Gourmania.com is a popular resource for recipes, cooking advice, and more. She also has a fun cooking group online called Norene’s Kitchen, which is where I first “met” her online. I had a great time speaking with her on the phone and getting to know her better. The interview appears below. 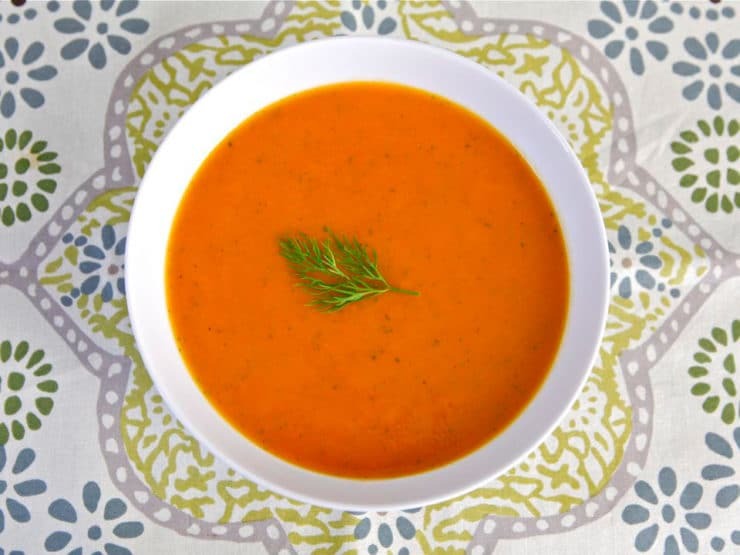 After the interview, you’ll find Norene’s recipe for Carrot and Sweet Potato Soup from The New Food Processor Bible. It’s a healthy soup with a lightly sweet and fresh flavor, including fresh herbs, honey (you can omit the honey to make it completely vegan), and a touch of lemon juice. My mother was born in Russia. My father’s family came from Poland. My mother came when she was 6, so in about 1921. My father was born in Winnipeg. My mother passed. She’d be 98 today, so almost 100 years. She never needed a recipe. She could cook anything. When you were growing up and celebrating Rosh Hashanah with your family, what were your favorite dishes that your mom made? My mother always made potato knishes and carrots and honey cake. Some sort of chicken. The joke was, well my mother didn’t really go to shul, she sent us with my father. So my mother would say, “your bubbe is going to ask you what I made, so tell her that I made roast chicken.” And I’d say, “but Mama, you didn’t, how can I tell a lie?” And she’d say that my grandmother would expect to hear that she made roast chicken, so tell her that. She’d always make a carrot dish that I have the recipe for somewhere. She made honeycake with buckwheat honey, because it had a different flavor. And she always made her honeycake with tea, not coffee. I remember the buckwheat honey was very thick. And I don’t really have her recipe, I just take my recipe and modify it. I remember in my mind how my mother made it. So would you say your mom was a major influence on your culinary career. Norene, you’re the master of the food processor. 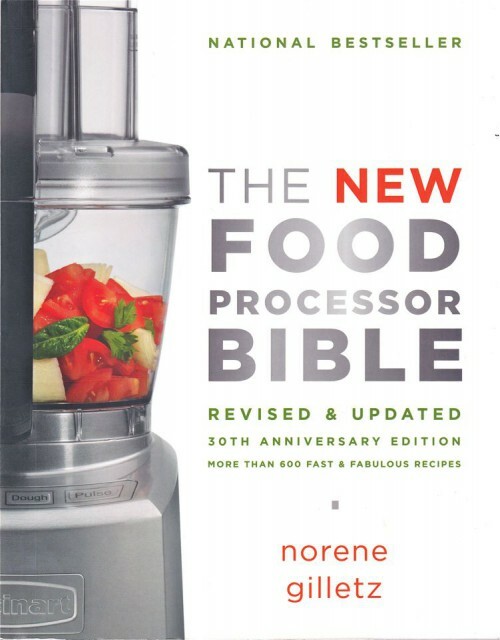 Your book, The Food Processor Bible, was recently released in a 30th anniversary edition. 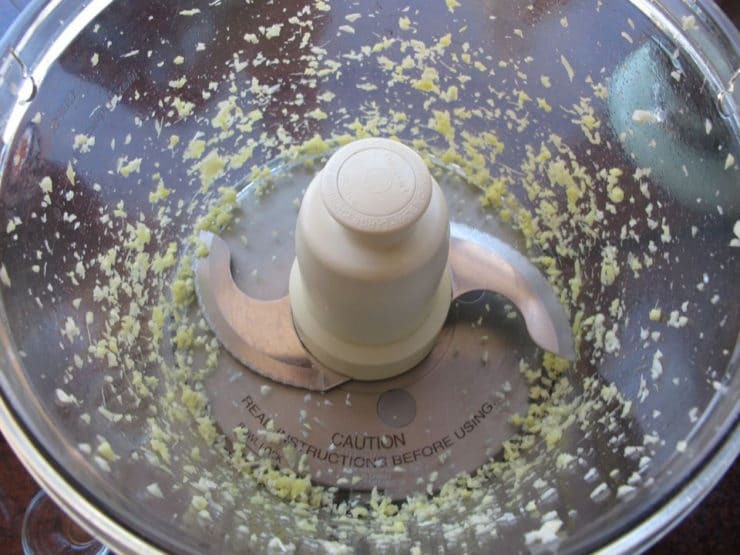 How did you get into the whole food processor thing? Years and years ago, I was part of a committee that did a fundraising cookbook called Second Helpings Please. We were all in our 20s, and we were really trying to capture our mother’s and our grandmother’s recipes to put them into print. We thought it would take us about 3-4 months to collect everything, and it took about 3.5 years. So we worked hard to promote the book, and as a result people would call me asking how do you make this, how do you do that… so I was cooking and baking a lot. Then I went to a trade show and saw the food processor in action. I had started writing my own cookbook, everyone was saying “you should do something yourself,” and I felt I could. I had lots of energy and nobody could keep me down. So by then I had done about half a book. 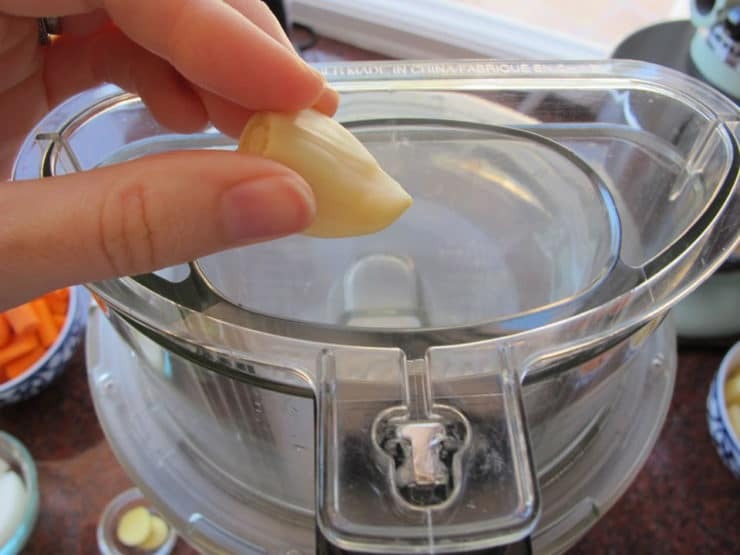 You know, all of my favorite kinds of recipes… and I met my first food processor. After about a month of using the machine, I thought, you know what? I’ve got this thing mastered, and I can do things quickly and efficiently, and it just saved time. My mother was always looking for shortcuts. She had a little hand grater, she had a hand-turning-thing where you would change the disc, almost like a meat grinder. I forget what they called it. But suddenly here was this food processor, and the results were fabulous. And the machines were so simple to use. So I took all of my recipes and converted them for the food processor. I’m curious about what drew you to a career in cooking. When I was working on the fundraising book, I leaned that I could explain recipes very clearly, so that people could reproduce them. I had taught swimming when I was in my teens, so I was very good at presenting visual images. In my own learning pattern, if I would have a visual image, then it was very easy for me. Everything I write has a visual image, because otherwise I don’t understand the instructions myself. Because of that, my instructions are very clear. The deficit made me a much better writer. And I love food. I was very fascinated by how things were made. Everything was new. I had an instinct for a good recipe; I just knew it was good. I knew how to capture it and write it down. There were no computers then. When we did Second Helpings, we typed the recipes on 4 x 6 cards. And then we made a binder, and I kept moving things around. You know the little photo holders? Every time we got a new recipe, I kept having to move everything all the way down to add to a section. I love to teach and share. I was always bringing things to my kids’ school, and I was very involved the community. I cooked all the time and I was brought up that you prepared it at home. My mother would come to visit or I would go to Winnipeg and watch how she made things. When did you decide that food would be your life’s work? I joined the IACP. There were no cooking classes available in Montreal. I went to an IACP conference, and I met people who understood me. My friends thought I was crazy because all I was interested in talking about was how you make this thing or that. And when I went to IACP, everybody understood what I was about. I had people I could talk to. I wasn’t interested in playing games or tennis. That just didn’t ring my chimes at all. I love the art of creating. You know, I watched Julia Child, learned how to make puff pastry. 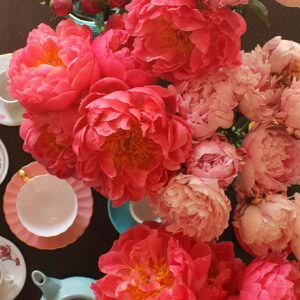 I used to go in the kitchen after my kids were asleep and cut onions different ways, and I would make onion blooms with different garnishes. I’m left handed, so I had challenges in learning how to do things that were pretty or fancy. I’m not a fancy cook, but I write very clearly. If I give you a recipe, it works. My conscience knows it’s right. When I try other people’s recipes, I know the error. I just know. I create a visual image when I write, when I edit my own work or anybody else’s work, and I can find an error in a book like you wouldn’t imagine. You obviously love to teach and share your cooking knowledge. I’ve noticed that some people are protective of their recipes. Can you relate to that at all? Do you have a few recipes that you will never share because they’re so special, or are you an open book? I always share, and I’ll tell you why I share. A woman told me a story about a dozen years ago about her father’s bakery in Winnipeg, which is where I grew up. And I remember going to that bakery as a little girl and I remember the smell of everything, you know that wonderful yeasty smell? I’d go in with my mother and it was such a good sensation to be able to smell everything… the warm baked goods on the walk home. So, she told me her father owned the bakery, and his head baker had a bread recipe that he would never share… and then he died. What’s the point of knowing something? I know some people have these secret ingredients that they would never share. Like my aunt made these amazing cinnamon buns, and she used real butter, and her technique with the yeast was so incredible. She could pull dough so thin you could really read the newspaper through it. And I would tell my aunt her cinnamon buns were so good, and my mother would ask what was wrong with her cinnamon buns. Like it was a competition. So people cooked their trademark dish. And there was an issue with people taking their recipe and turning it into a commercial product. It’s an issue of intellectual property. You know, it doesn’t matter what the recipe is., if someone gives you a recipe there’s always something missing or changed. I don’t do that, though. I like sharing. I always think of recipes as being short stories. And people often do share. They’re looking for a taste memory, because a memory of food will literally transport you back to that table as a child or whenever. There’s a group called Montreal Memories and they go into these raptures about food they remember from their childhood. I remember cherries from when I was 3 or 4 years old with my zayde (grandfather). I don’t remember much else, but that he smelled like tobacco and the cherries. The cherries bring back a strong memory. Me sitting on the grass and wiggling my toes. It’s an old one. If you could pick one food that’s your favorite in the world, what would it be? Kasha. I love the fried onions. I usually cook one box of kasha with one egg. I love the aroma. I’ll double the amount of liquid. And lots and lots of fried onions that are nice and crispy golden brown. I cook them in olive oil, and sometimes I put mushrooms in. I’ll make a meal from it. Kasha and bowties, or any type of pasta that I might have. My bubbe used to make handmade dough. She would make a pasta dough, roll it out and cut it into squares and boil it very quickly. And I like matzo balls. I like all of my old traditional stuff. My tastes have changed. I can’t eat a lot of the heavy stuff anymore. I’ll have a steak once in a while. I like a good salami sandwich, but not very often. Growing up we always had a dried salami hanging in the closet next to the broom. Now I can’t eat it the same way because of all of the salt. It’s a treat. I eat a lot of vegetarian. I love a dairy kugel or a vegetable kugel. I like potato latkes. And I love to share food with friends. This soup would make a nutritious addition to the Rosh Hashanah menu. It’s also a great option for Sukkot because of the beautiful autumn color and the inclusion of seasonal root vegetables. Enjoy! 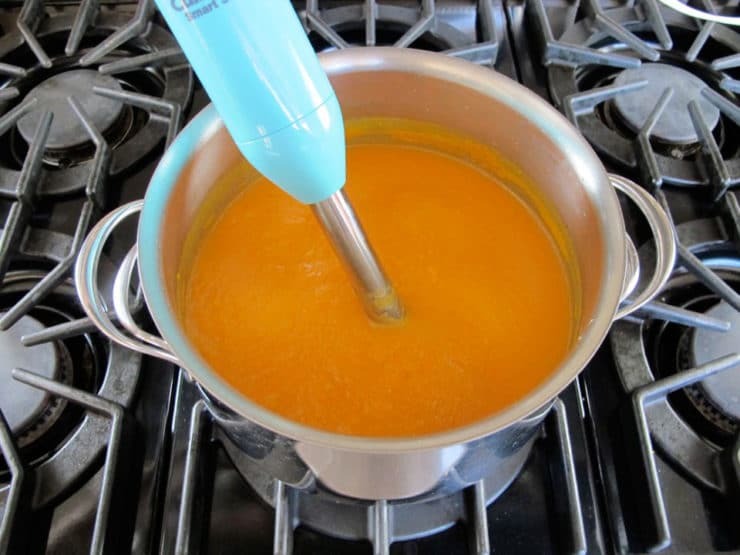 An Interview with Norene Gilletz, author of The Food Processor Bible, and her recipe for Carrot and Sweet Potato Soup. Vegan, Gluten Free, Pareve. Place the steel blade on your food processor. Drop garlic and ginger through feed tube while machine is running. Process until minced. (Use mini-bowl and mini-blade if available) Set aside. 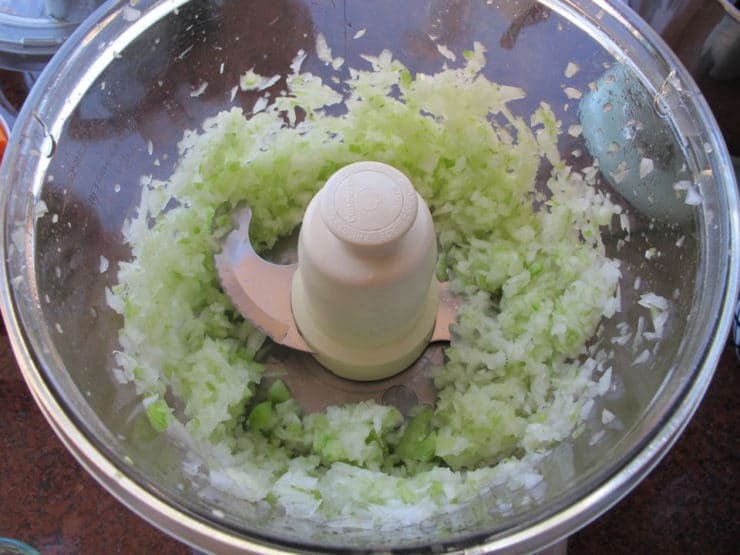 Process onion and celery with quick on-off pulses, until coarsely chopped. Heat oil in large soup pot. 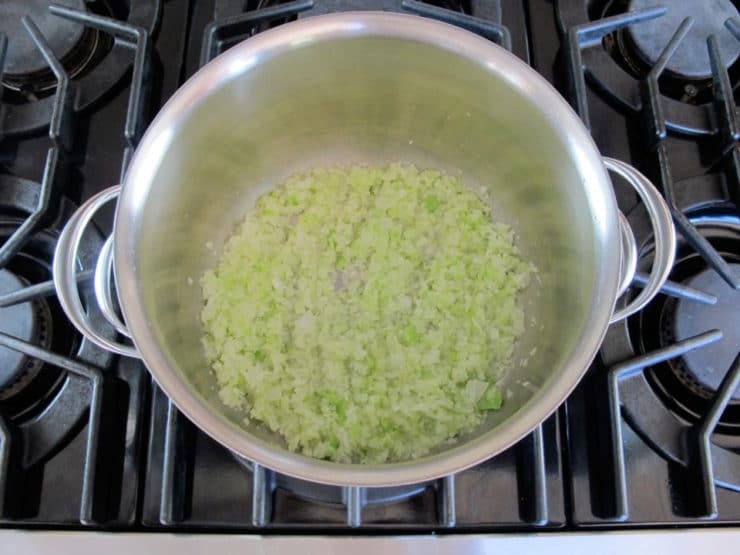 Saute onion and celery for 6 or 7 minutes, until tender, stirring occasionally. Add a little water if the vegetables begin to stick. 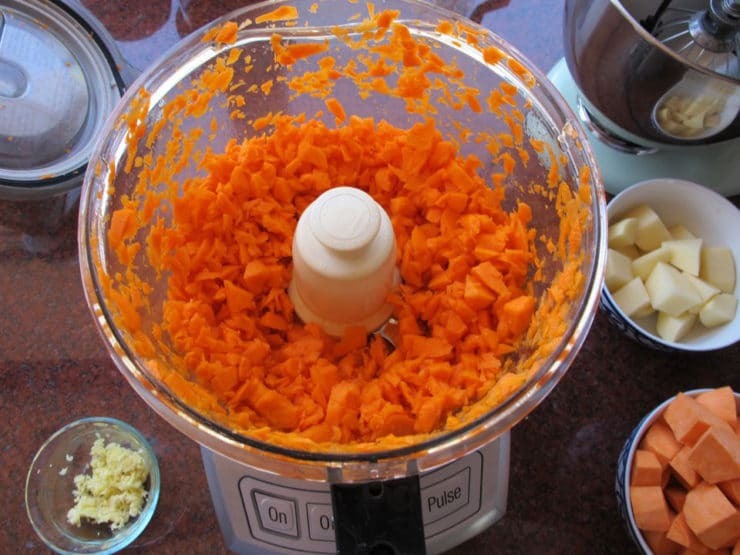 Process carrots with quick on/off pulses, until coarsely chopped. Add to soup pot along with reserved garlic and ginger; cook 2 minutes longer. 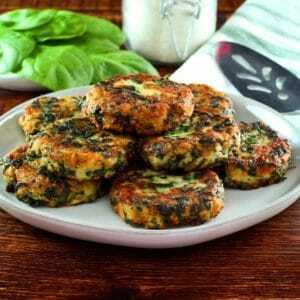 Coarsely chop potato and sweet potatoes. Add to soup pot along with water or broth, salt and pepper. 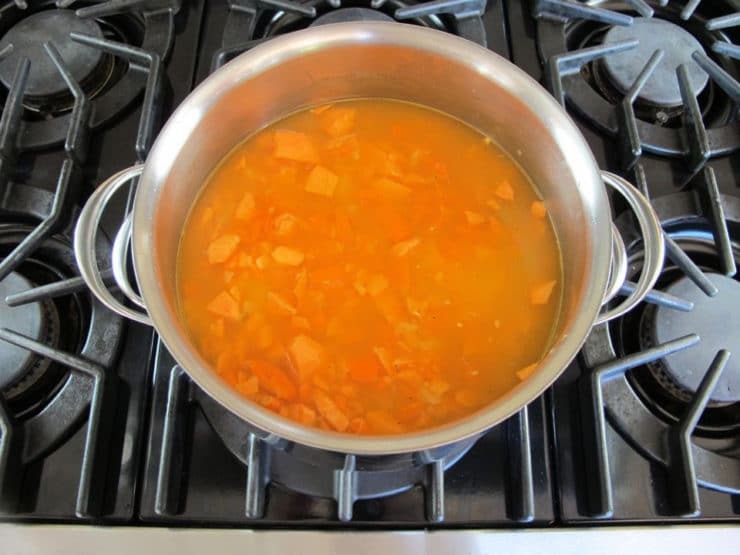 Bring to a boil, reduce heat and simmer, partially covered, for about 30 minutes, until vegetables are tender. Process basil and dill until minced, about 10 seconds. Reserve. When the vegetables are nice and tender, puree the soup. 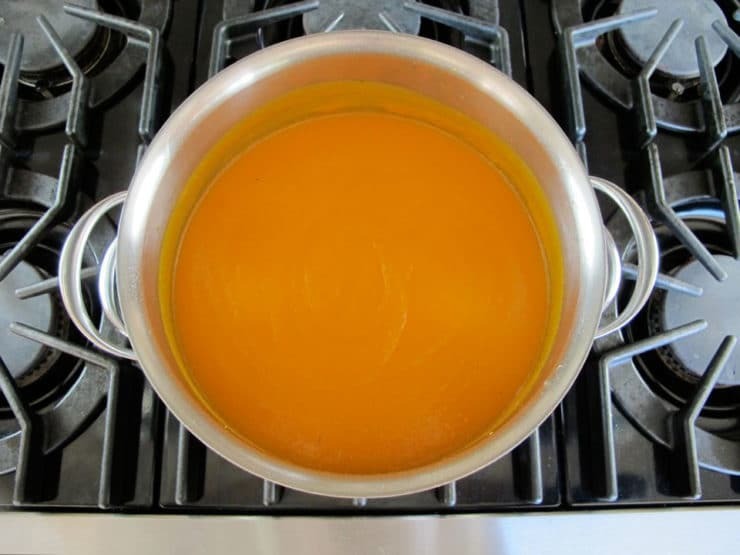 Because of the quantity, it is easiest to use an immersion blender and puree the soup directly in the pot. 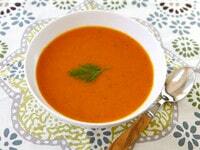 Alternatively, to puree soup in processor, place a strainer over a large bowl or saucepan. Strain soup, reserve cooking liquid. Puree solids on the steel blade attachment until smooth, working in batches if necessary. 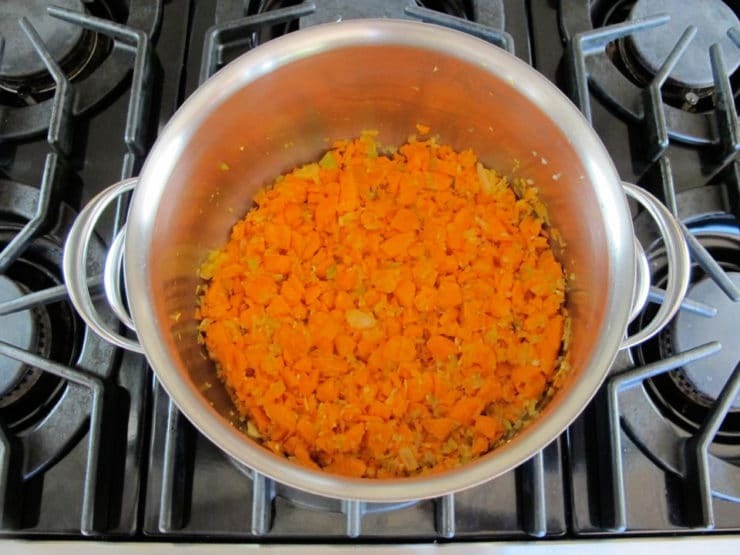 Stir pureed vegetables into the reserved cooking liquid. 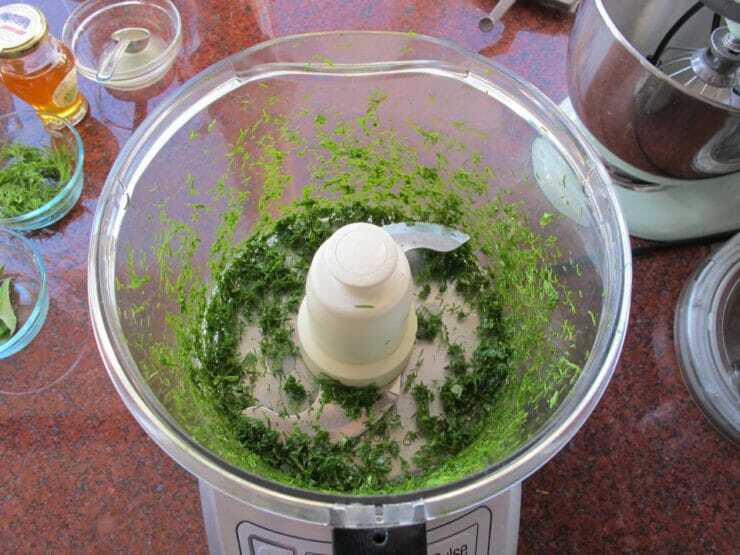 Add minced basil, dill, lemon juice and honey to the soup (I used the immersion blender to blend them into the puree). Season with salt and pepper to taste. 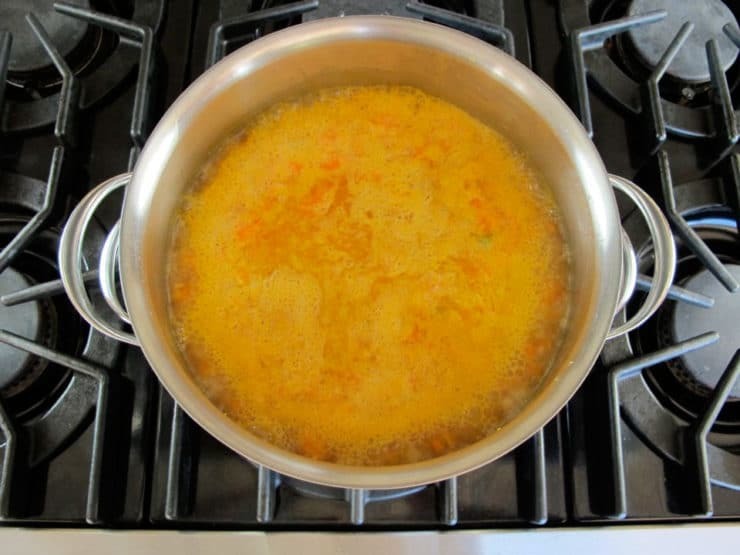 Add additional water if the soup is too thick. Serve hot. Garnish with a sprig of fresh dill, if desired. Keeps 3 days in the refrigerator. Reheats and/or freezes well. I know I’m a bit late to the party, but I figured I would report in anyway. I just made this for dinner on a stormy night and it was PERFECT. I don’t have a food processor so I just chopped by hand and used an immersion blender. I swapped out the dill and basil for parsley and celery leaves because that’s what I had…and it was really great. Thank you! Never late to this party, Sara. Happy you liked it, and I know Norene would be happy to read that too! What a beautiful presentation! I am so excited to try this soup tomorrow. My big processor went on the lam…and managed to get a small one for real cheap and am eager to get back into some great recipes…My in-laws are having a beach week this summer on one of the finger lakes in NYS and everyone is invited!! Lots of room and every one will cook a meal ….so looking forward to making the meatballs for an app and then again this soup…this soup could be soooo good cool on a hot afternoon aftr biking and kayaking! I will keep watching for more surprises!! 3 of her cook books and most recipes are excellent. I have her food processor book, plus 2 others. I have been wanting to come and correct this since I made the meatballs for Rosh Hashanah. Norene’s cookbook that is THE ONE is called The Pleasures of your Processor. My copy is from 1982 and I successfully hunted down copies of this fabulous book for both of my daughters. 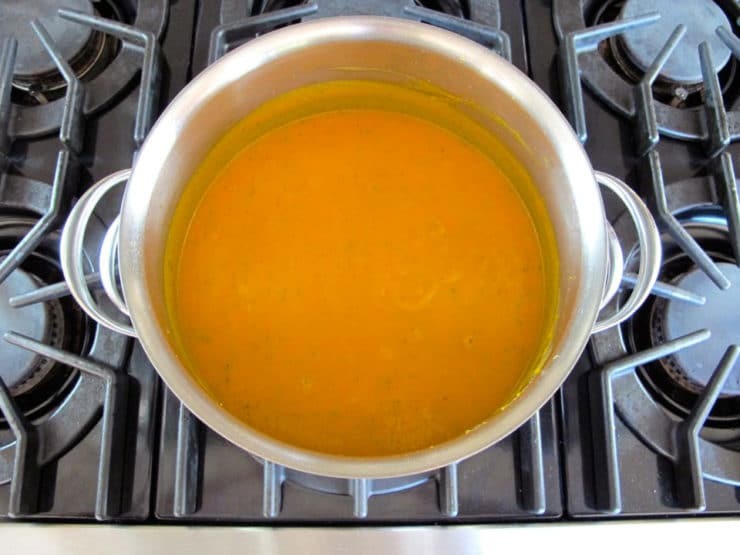 The soup is delicious – thanks for another wonderful recipe! This is a perfect organic coop recipe!! I had everything in the fridge and it is in the final stages now. I did change the spices a bit to our tastes. I used tarragon in place of dill, we love that licorice hint and added a teaspoon of methi powder and some applesauce for a bit of sweet in place of the sugar. I used water not broth but added a bit of parsley for balance. It smells wonderful and the hubby is out getting a loaf of pumpernickel bread as a sidebar. Thank you for your wonderful contribution and especially for the vegan note as we are of that ilk. It may reappear on my succah table as a starter with some raisins sitting on top of a dollop of cashew kream! Beautiful soup! I’m so excited for soup season (Autumn) to be here! I like your use of dill and honey in the recipe – sounds light and fresh for the season change – I’m going to try it. I live in Montreal and thanks to Noreen and my battered copy of The Food Processor cookbook, I have gone through two food processors and will soon be in the market for a third! Some of my family’s favorite recipes have been adapted from Noreen’s cookbooks and I will be serving the meatballs (with grape jelly as the secret ingredient) as a side dish for Rosh Hashanah. Thank you for all of the wonderful meals we have shared because of you, Noreen. L’Shanah Tovah! You are right – the love is in the giving. Thanks for this gift of hearing you talk cooking. Great interview and wonderful recipe! I’m from Montreal and I grew up with my mother cooking Noreen’s recipes from Second Helpings and The Food Processor cookbook. My mother is a great cook and Noreen’s reliable, delicious recipes definitely contributed to that! I really need to get my food processor out more often. Look how easy that was! This soup is such a beautiful color.